A Definitive Guide to Girder Forks! Motorcycles have gone through definitive changes over the years, as has many of their parts, including girder forks. They were the first form of front-end suspensions in any bike. It kick started the evolution of motorcycles and paved way to the future. Girder front ends dominated the market for good part of two decades after its inception. Here is a closer look at them, including their history, types, advantages, and disadvantages. Girders are one of the oldest types of front suspension design used in motorcycles. When you look at them you will notice a pair of legs connected to triple clamps with springs that are usually present at the upper or lower part of triple clamps. The idea came from “Girdraulics,” which were used in Vincent motorcycles. It uses a combination of alloy blades and hydraulic damping that used to give it an edge over others when it comes to braking and strength. Let’s take a look at their history. H.C. Webb & Co. Springer / Girder Forks. It all began when the first girder fork assembly was created. It is argued that the Druid springer fork was the first real set created. It was fitted on an Ariel motorcycle in 1913. The Druid fork belonged to a parallelogram family of forks. You can easily distinguish Druid forks from others, thanks to its solid front brace at the front and coil springs at the rear end. Some also contain a rebound spring but there was no concept of damping at the time. The older variants of girder front ends were fitted on Triumph’s mid 1920’s motorcycles models. It had a slider at the top and hinged lower link. It was a major breakthrough because it altered the steering geometry used in those days in other bikes. It allowed the liberty to move forward and backward during compression, which was a novel concept at that time. British Motorcycles was very popular during World War 2, which used a Webb Fork front end, which also belongs to parallelogram family. It was a big step up from a Druid because it added a damper, tapered coil springs and was controlled by a large central spring. 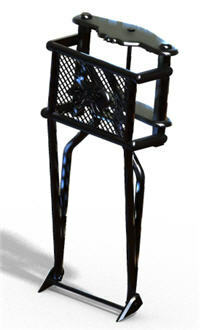 Next came the Girdraulic fork, which replaced welded tubes with alloy blades. 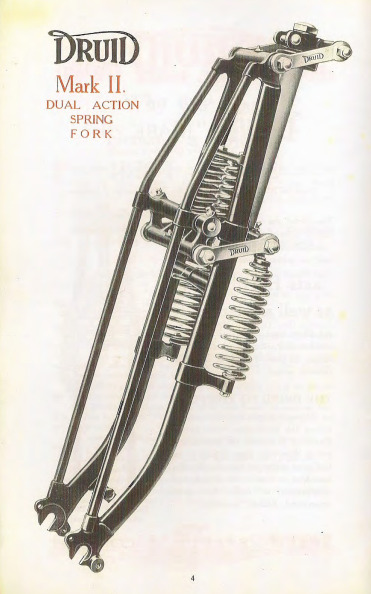 Girder forks evolved from there and managed to reach the heights of popularity. Similarities and Differences Between Girder and Springer Front Ends! Our Girder Front End Design. Our Springer Front End Design. 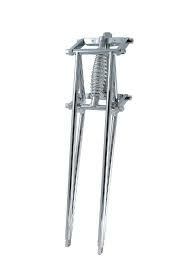 Here are some of the major differences and similarities between Girder and Springer Forks. The biggest advantage of hydraulic forks is its flexibility in design. One aspect that makes hydraulic forks stand out from Springers and Girders forks is its covered suspension. Whether you are a hydraulic fork fan or not, you will have to admit that it is quite popular. When it comes to downsides, it’s heavy weight design is a big letdown. Its weight puts a lot of pressure on the tires and wheels. It is argued that they are not well suited for raked bikes, but I see them all the time and they are very popular. Lightweight, old school chopper styling and low maintenance are some of the highlights of Springer forks. Go for Springer forks if you prefer longer length forks. Harmonic and vibration prone designs, along with a lack of trail adjustment are major shortcomings for Springer forks. What’s more, you will have to make an allowance for mounting hardware. Similar to Springer forks, Girders are also good for longer lengths. Girder forks take the lead because they give you an option to mount hardware. The shock and spring used in girder forks plays a key role in giving you a smoother ride. What goes against girder forks is its harmonic and vibration prone design. You will have to buy special mods to adjust the trail, otherwise it’s not possible. Ironically, the more modern girder front ends (alloy blades, better hydraulics, adjustable suspension) were considered to be a good option for racing because they didn't nose dive and the geometry of the bike was stable. In addition they absorbed bumps well and could be adjusted to the riders needs. But many bikes were using telescopic front ends at the time which where not very expensive, and they light. But the problem with them is they nose dive and bind as well as they create problems with trail. This is still a problem with these types of forks today. Advantages and Disadvantages of Girder Front Ends! The main reason why you are converting your bike into choppers and bobbers it to customize it to suit your needs and make it stand from the crowd. Girders are difficult to find making them a unique addition to your chopper. Build a set yourself! 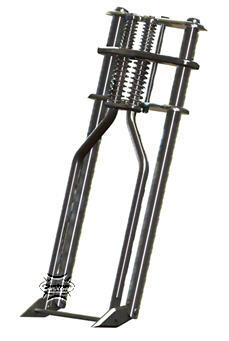 The biggest advantage of using girder forks on your bobber or chopper is its lightweight design. What makes it so special is that this lightweight design does not compromise on strength. One factor that has played a key role in demoting girders over the years is its price. Girder forks are quite expensive to manufacture and are therefore sold at a higher price. If you are planning to fit one on your chopper and bobber be prepared to pay a premium price for it. You might get lucky and find a some on eBay but beware of how they were built. Another disadvantage that is interrelated to the high manufacturing cost is its lack of availability. You may have to search frequently to find a a girder front end for your chopper or bobber because they are not easy to manufacture. You may have to get it custom made for your bike. Or you can buy a set for $600 on eBay and design your bike around the front end. Hopefully after reading this article you know quite a bit about girders. From what they are, to its historical background, you should be able to tell the differences between Girders Springers along with their advantages and disadvantages for different motorcycle front suspensions.